A team of BAC students, faculty and staff came together and has worked tirelessly for several months to create a small new place on campus that has been much in demand. 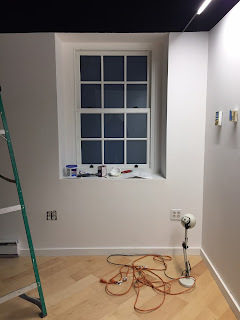 In the basement of 322 Newbury Street, a former server room now has two new windows, a new wood floor, a bench and cubbies for shoes – and it has space for BAC students to come and reflect whether they meditate or pray in an atmosphere of calm, quiet and mutual respect. The space will be open during regular campus hours. Monday is what is called a “soft opening”, and the space will experience a couple of closures for finishing touches to the design-- including threshold screens and wood surfaces to complete the design team’s vision for a warm, comfortable environment. The BAC Student Government Association 2016/17 and President Glen Leroy who listened to students and made this project a top priority.